When the surfaces of the skis slide on the snow, friction is caused. This kind of friction creates a water film, which can, depending on the temperature, be either too strong or too weak. Too much water creates a pulling effect, which slows you skis down. The air is another important factor. Imagine you position two glass plates atop one another – it will be almost impossible to move them. As soon as the air gets in-between them, both plates will slide about one another. We apply this principle and provide the skis with a structure. With regard to shape and depth, this structure is as different as snow and temperature. We provide the performance-oriented skier with a selection of top-quality structural grindings, which have proven themselves to be effective under a wide range of conditions; the hobby skier finds universal grindings, which cover a wide range of applications. 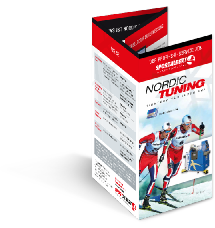 By finally treating the newly structured skis in the thermobox, each pair of skis receives the Racefinish and can even be used the following day in the race. Together, grinding and thermobox treatment result in excellent sliding performance, which can be optimized with the wax available at the day of the race.